Malaysian Watercolours: Water Containers - to hold water for your colours! 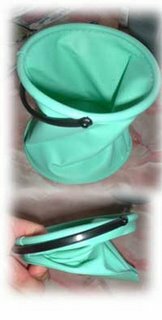 Water Containers - to hold water for your colours! If you painting in the studio, you can have anything as your water container if you wish. From old jam bottles to expensive water troughs. As for me, I use an old honey bucket which is made of plastic. It is hardy and has a nice little handle to carry when filled with water. For outdoor, however, I used a foldable bucket (picture at left). It is about 5 inches in diameter and can be folded like an accordion. This makes it easy for me to fold into my painting case - in which I also store my papers, paint, brushes and other stationery - including a towel. However, I think you can make some real handy water containers and you dont have to spend money on expensive troughs if you want to paint in watercolours. I have made some for friends using old PET bottles (those that are used to store cordials). Just cut the top third off the main body and handle and you will have two usesful areas. The smaller aperture of the handle can be used to prop up your brushes in between brush changes while the bigger aperture (the body of the bottle) affords you with the ease of dipping and cleaning your brushes.